There's been a lot of good news for Barack Obama in the national polls lately and certainly that's important. But we still have this funny little electoral college so what's going to be most vital for his reelection prospects is how he does in the key swing states. And there's good news for him there as well. So far we've done 2012 Presidential polls in 6 of the 9 states that George W. Bush won in 2004 but that Obama won in 2008. Obama leads 23 out of 24 hypothetical match ups that we've tested in those states. -Obama leads Romney by an average of 3 points in these red to blue states, Huckabee by an average of 4 points, Gingrich by an average of 9 points, and Palin by an average of 13 points. -With the exception of Huckabee voters in these key states generally do not like the Republicans running for President. A majority in every one of them has an unfavorable opinion of Palin- that number is between 57 and 59% in five of the six states and 52% in the other. Gingrich is viewed unfavorably in each of the states as well- his negative number ranges from 47% to 53% with his favorability falling only in the 30 to 36% range. Voters have a net positive opinion of Romney in Nevada and Florida but not in the other four states. Huckabee's favorability never goes above 43% in any of the states but his unfavorability doesn't go above 43% either and he's above ground in 4 out of 6 with the exceptions being Florida where voters are slightly negative toward him and Virginia where he breaks even. 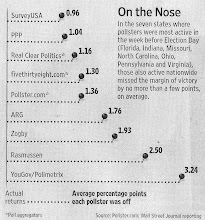 It's also worth noting that these polls were all conducted before Obama's recent popularity surge. If Obama had to stand for reelection today he'd get pretty much the same number of electoral votes he did in 2008. The Republican candidates have a long way to go to have any chance of winning the Presidency back in 2012. Please say you tested Obama vs Palin in Texas??? Do you plan to poll NH? I say that because i think than at this time NH is certainly less friendly territory than others swing states even the unemployed number is very low there. So, Why? I don't know. Poll NH and also CO please. In the 2012 election, pundits and campaign operatives already agree that only 14 states and their voters will matter under the current winner-take-all laws (i.e., awarding all of a state’s electoral votes to the candidate who receives the most popular votes in each state) used by 48 of the 50 states. Candidates will not care about 72% of the voters– voters in 19 of the 22 lowest population and medium-small states, and big states like California, Georgia, New York, and Texas. 2012 campaigning would be even more obscenely exclusive than 2008 and 2004. Candidates have no reason to poll, visit, advertise, organize, campaign, or care about the voter concerns in the dozens of states where they are safely ahead or hopelessly behind. Voter turnout in the “battleground” states has been 67%, while turnout in the “spectator” states was 61%. Policies important to the citizens of ‘flyover’ states are not as highly prioritized as policies important to ‘battleground’ states when it comes to governing. And just think, this is before people spend two years getting tired of Republican idiocy in the House. Just wait for House Republicans to start talking up a government shutdown, or presenting their spending proposals (since the House has to originate spending, House Republicans cannot avoid being the ones to put up plans anymore). That's not even including people getting tired of Republicans in state governments. Florida dislikes their new Republican governor already. Arizona's Republican-controlled government is proposing unpopular draconian cuts in services. Texas has a $27 billion hole in their budget due to an ill-conceived government giveaway in their last budget, and is talking seriously about dropping Medicaid to avoid the obligations there (which would enrage seniors and might end up being enough to swing the state after all). New Hampshire's Republican supermajority is already going completely bonkers. Ohio's Republican-controlled government has no direction to offer the state's flaccid economy. That's the downside to winning an election thanks to historically low turnout. You give all the people who didn't vote for you last time some incentive to vote against you the next time around. Indiana might be interesting. Indiana is the most conservative state in the northeastern quadrant of the US, but it isn't crazy. having Obama campaign headquarters in Illinois makes Indiana unusually tough for any Republican nominee except Daniels. Another one of interest would be Georgia because of the political demographics -- half Greater Atlanta and half Deep South. "Please say you tested Obama vs Palin in Texas???" "Do you plan to poll NH?" No current plans, but obviously we will at some point, at least to poll the presidential race. I'd personally love to poll CO, but it keeps losing our blog reader polls. How big a factor will redistricting play? I hear Ohio and Pennsylvania will both lose 2 seats while Texas will gain 4. Oh I wish Indiana were in play for Obama next time 'round. As an active Indiana Democrat, I'm afraid I can only conclude that no Democrat stands a chance in 2012 here; I don't even think we have a good shot at our governor's race then. Our Democratic candidate for Senate in November lost by approximately as much as Christine O'Donnell! New Hampshire had a historically-unprecedentedly low Democratic turnout in 2010, with high Republican turnout. The new Republican supermajority legislature has already gone so far overboard that even the Republican state propaganda outlet, the Union Leader, has called on them to rein it in, and it's only January of their first year. Look for a third massive swing in state control in 2012, with Democrats reclaiming at least one house of the state legislature, just based on returning to average turnout by both sides. It might be closer at the presidential level than 2008, but maybe not - McCain started out with a relatively high approval in NH, but lost by 10. Romney has mediocre NH approval and none of the others has any significant base in the state. toto - I agree with you that we should have a national popular vote for President (I even wrote a paper about my support for a national popular vote in HS) ... but I don't think it's likely to happen by 2012. I think a national popular vote definitely benefits the Democrats because there are more small red states with bloated electoral votes (due to having 2 senators even though they have low population) than small blue states. And of course Al Gore would have won the 2000 election if it were based on popular vote instead of electoral votes. National Popular Vote, while an interesting idea, would be a nightmare in practicality. Imagine if, say, state A has laws on the books stating that absentee ballots will not be counted if there are not enough absentee votes to make up the difference between two candidates. State A does not subscribe to NPV. State B has a law assigning its electors to the winner of the national popular vote, but the election is close enough that the absentee votes from state A matter. State B cannot compel state A to count those absentee ballots. Just imagine if Florida 2000 had not been limited to Florida, and instead every single district across the country had to perform recounts. It would have been a nightmare. And that's just logistics, ignoring the potential for Republican shenanigans, having to watch every counter in the country, etc. If you want NPV, then call for a Constitutional amendment and do it properly, not a patchwork of state laws that could very readily run into dependencies on other states that don't use the system at all. Now political clout comes from being a battleground state. Now with state-by-state winner-take-all laws presidential elections ignore 12 of the 13 lowest population states (3-4 electoral votes), that are almost invariably non-competitive, and ignored, in presidential elections. Six regularly vote Republican (Alaska, Idaho, Montana, Wyoming, North Dakota, and South Dakota), and six regularly vote Democratic (Rhode Island, Delaware, Hawaii, Vermont, Maine, and DC) in presidential elections. Nine state legislative chambers in the lowest population states have passed the National Popular Vote bill. It has been enacted by the District of Columbia and Hawaii. which every vote would be equal, this wastage would not occur. District of Columbia’s 164,869-vote margin. State-by-state winner-take-all laws to award electoral college votes were eventually enacted by 48 states AFTER the Founding Fathers wrote the Constitution. The Founding Fathers only said in the U.S. Constitution about presidential elections (only after debating among 30 ballots for choosing a method): "Each State shall appoint, in such Manner as the Legislature thereof may direct, a Number of Electors . . ." The U.S. Supreme Court has repeatedly characterized the authority of the state legislatures over the manner of awarding their electoral votes as "plenary" and "exclusive." In 1789, in the nation's first election, the people had no vote for President in most states, Only men who owned a substantial amount of property could vote. In 1789 only three states used the state-by-state winner-take-all method to award electoral votes. The winner-take-all method is not entitled to any special deference based on history or the historical meaning of the words in the U.S. Constitution. The current 48 state-by-state winner-take-all method (i.e., awarding all of a state's electoral votes to the candidate who receives the most popular votes in a particular state) is not mentioned in the U.S. Constitution, the debates of the Constitutional Convention, or the Federalist Papers. The actions taken by the Founding Fathers make it clear that they never gave their imprimatur to the winner-take-all method. As a result of changes in state laws enacted since 1789, the people have the right to vote for presidential electors in 100% of the states, there are no property requirements for voting in any state, and the state-by-state winner-take-all method is used by 48 of the 50 states. Maine and Nebraska currently award electoral votes by congressional district -- a reminder that an amendment to the U.S. Constitution is not required to change the way the President is elected. The Constitution does not mandate the means by which states allocate their electors, but a scheme like NPV is inherently dependent on every state joining in. What if you got enough states to sign up to NPV - and then, say, Texas switched to "electors are appointed directly by the governor?" Suddenly there is no longer a popular vote at all in a large, Republican-leaning state. To make NPV work, you need to have all the states engaged in it in such a way that they can't shatter the system by pulling out. That state-by-state ability to select its own method is exactly why NPV would require a constitutional amendment to be implemented safely. To put that list of states in perspective, you could also say "Eight entire states with enormous Republican margins were almost entirely balanced by eight states with Democratic margins - but the total Republican edge in those sixteen states is less than a tenth of the Democratic margin in California alone." The bill would take effect when enacted, in identical form, by states possessing a majority of the electoral votes--that is, enough electoral votes to elect a President (270 of 538). When the bill comes into effect, all the electoral votes from those states would be awarded to the presidential candidate who receives the most popular votes in all 50 states (and DC). "Any member state may withdraw from this agreement, except that a withdrawal occurring six months or less before the end of a President’s term shall not become effective until a President or Vice President shall have been qualified to serve the next term." The important point is that an interstate compact is not a mere “handshake” agreement.68 If a state wants to rely on the goodwill and graciousness of other states to follow certain policies, it can simply enact its own state law and hope that other states decide to act in an identical manner. If a state wants a legally binding and enforceable mechanism by which it agrees to undertake certain specified actions only if other states agree to take other specified actions, it enters into an interstate compact. Based on the current mix of states that have enacted the National Popular Vote compact, it will take about 25 states to reach the 270 electoral votes needed to activate the compact. The National Popular Vote bill has passed 31 state legislative chambers, in 21 small, medium-small, medium, and large population states, including one house in Arkansas, Connecticut, Delaware, The District of Columbia, Maine, Michigan, Nevada, New Mexico, New York, North Carolina, and Oregon, and both houses in California, Colorado, Hawaii, Illinois, New Jersey, Maryland, Massachusetts, Rhode Island, Vermont, and Washington. The bill has been enacted by the District of Columbia, Hawaii, Illinois, New Jersey, Maryland, Massachusetts, and Washington. These seven states possess 74 electoral votes -- 27% of the 270 necessary to bring the law into effect. In terms of recent presidential elections, the 11 largest states include five "red states (Texas, Florida, Ohio, North Carolina, and Georgia) and six "blue" states (California, New York, Illinois, Pennsylvania, Michigan, and New Jersey). The fact is that the big states are just about as closely divided as the rest of the country. For example, among the four largest states, the two largest Republican states (Texas and Florida) generated a total margin of 2.1 million votes for Bush, while the two largest Democratic states generated a total margin of 2.1 million votes for Kerry. * New Jersey (53% Democratic). To put these numbers in perspective, Oklahoma (7 electoral votes) alone generated a margin of 455,000 "wasted" votes for Bush in 2004 -- larger than the margin generated by the 9th and 10th largest states, namely New Jersey and North Carolina (each with 15 electoral votes). Utah (5 electoral votes) alone generated a margin of 385,000 "wasted" votes for Bush in 2004. 8 small western states, with less than a third of California’s population, provided Bush with a bigger margin (1,283,076) than California provided Kerry (1,235,659). The 11 southern states provided Bush with a bigger margin (4,653,558) than the 6 states with the largest Kerry vote margins (4,428,268) in 2004. You're continuing to miss the point on the inherent problem with a NPV if not universally adopted. Let's say you get thirty states comprising 300 electoral votes to adopt NPV. Those thirty states are still dependent on the other twenty states, none of which have any obligation whatsoever to conduct their elections in such a way that it makes NPV meaningful. Texas, as I said before in an extreme-case example, could refuse to join NPV at all, and instead pass legislation authorizing the governor to appoint electors directly. Texas then does not hold a popular election for president, and no other state has any legal authority to compel them to do so. The NPV states are thus unable to determine who won the national vote and the jerry-rigged system failed. Less drastically, Texas might become annoyed at the concept of NPV and simply declare that they will not release official counts, only certified declarations of the winner with no indication of the margin. The contracts clause is irrelevant because the NPV proposal relies on the cooperation of states that are not part of the NPV regime. That's why it would require a constitutional amendment, to keep non-signee states from disrupting the system. Ohio and Florida, say, might not like the idea of losing swing-state status, and so deliberately prevent NPV from working. And then there's the practicality argument, that every district in the country would then potentially be in for months and months of recounts, with every single district subject to potential for errors and lawsuits. Do you really want to take Florida 2000 and multiply it to the entire country? I think that the States to watch in 2012 are going to be the midwest - Wisconsin, Michigan, Ohio, and even Pennsylvania. I'd guess that Obama can hold them - but he's going to have to do some work there. If a state continues to let its people vote for President, it will be conducting a “statewide popular election” (as that term is specifically defined in the compact). That state will, therefore, be automatically included in the “national popular vote total” computed under the National Popular Vote compact. In the unlikely event that the a non-member state were to pass a law abolishing popular voting for President, that state would be effectively opting out of the National Popular Vote compact. In that event, the President and Vice President would be elected by the voters from the remaining 49 states and the District of Columbia. There is no “Achilles’ heel” in the National Popular Vote compact; however, there would be an “Achilles’ heel” waiting any governor and legislature that implemented your hypothetical scenario. They would have to answer to their own voters for taking the extraordinary step of disenfranchising their own voters in the presidential election. The current state-by-state winner-take-all system has been a constant source of “chaos, litigation and confusion.” Under the current system, there are 51 separate opportunities for recounts in every presidential election. Recounts would be far less likely under a National Popular Vote system than under the current system. In the United States' 56 total presidential elections , there have been 5 litigated state counts which were totally unnecessary and an artificial crisis created by the current state-by-state winner-take-all system. Under both the current system and the National Popular Vote approach, all counting, recounting, and judicial proceedings must be conducted so as to reach a "final determination" prior to the common nationwide date for the meeting of the Electoral College. In particular, the U.S. Supreme Court has made it clear that the states are expected to make their "final determination" six days before the Electoral College meets. There are 51 opportunities for recounts, yes, each of which is limited to a single voting area. It isn't a constitutional limitation; it's a matter of practicality. Florida 2000 was nightmare enough. Your system still doesn't account for non-participating states that decline to count absentee ballots when there are fewer such ballots than the margin of victory; they would be meaningful only to other states. It's also a meaningless statistic to claim 'passed in 31 legislative chambers' except in the handful of states where it passed *both*. Most states prefer to keep their autonomy; if we wanted to use the popular vote as the sole basis of government, we wouldn't bother with the Senate, either. Most voters don't care whether their presidential candidate wins or loses in their state . . . they care whether he/she wins the White House. Voters want to know, that even if they were on the losing side, their vote actually was counted and mattered to their candidate. Obama will not run for a second term because his records have been sealed and voters will all become Birthers when it comes to lack of full disclosure. You have to consider that the Republicans haven't united behind a candidate yet while the Dems have. So that's a problem with these early polls. I think what the poll shows is that Gingrich and Palin are not likely to beat Obama. Huckabee is not behind by more than 5 at this point in any of these states except Nevada and Romney trails by more than 5 only in Iowa. Both Huckabee and Romney would present a significant challenge to Obama. For any incumbent the important numbers this far out are job approval numbers. What are they for these states? Same polls with Trump vs. Obama? According to the CNN poll released May5, nationwide Ron Paul polls best against Obama. Why aren't you polling that match up? Although I am a supporter of Romney, I would like for any conservative to get in. Undoing the damage that Obama has done is going to be tough, but it should be started on as soon as possible! Where is Ron Paul in your polls? Isn't HE running for president too? In the latest rasmussen poll Paul had 38% while Obama had 39%. Isn't he a valid contender? I thought PPP performed "Accurate" polling?